After surveying 100 executives and 100 employees in 27 countries, we put together fact sheets that call out specific data points and quotes from the executives we interviewed in each country. The fact sheets will tell you how executives and employees from each country answer the surveys differently from their peers around the globe. 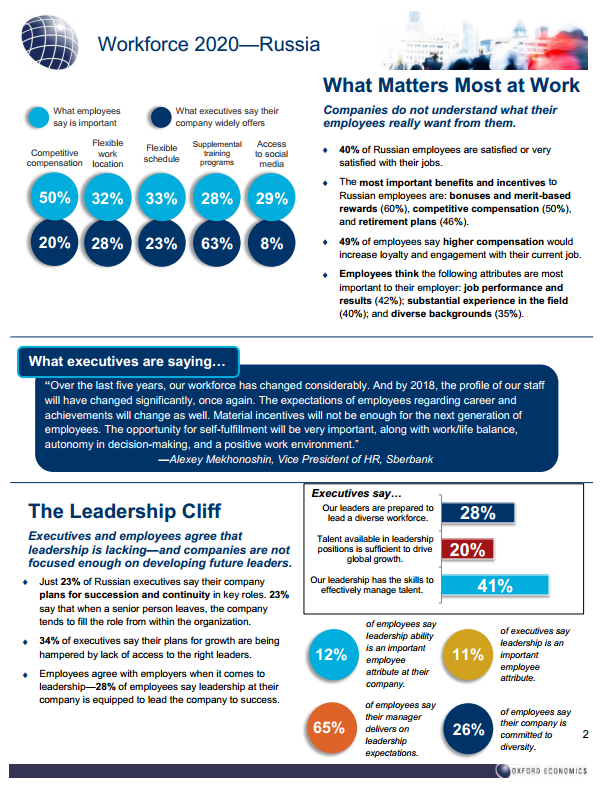 For example, you’ll see that while only 19% of all executives surveyed say leadership is a top employee attribute, the number is even lower in China, at just 4%. Another interesting finding: job satisfaction levels are significantly higher in Malaysia, where 57% of employees say they are satisfied or very satisfied with their jobs (compared with just 38%-third of employees worldwide). You can see all the country fact sheets on our landing page, or download them from the SuccessFactors Workforce 2020 page. This entry was posted in Research and Reports and tagged Country variances by Adrianna Gregory. Bookmark the permalink.